Following extensive research, development and field testing, the long-awaited Orbit Reader 20 is now produced and sold globally. Developed by Orbit Research in association with the Transforming Braille Group – a group of 10 non-profit organisations from various countries – this affordable braille device is sure to be a game changer in the promotion and development of braille literacy. The Orbit Reader 20 is a low-cost 20-cell refreshable braille display, braille reader and note-taker. Its stand-alone capabilities include reading, writing, and file management. For anything else, it connects to a host device. The Orbit Reader 20 then becomes a terminal that displays the braille for the braille app or screen reader running on a phone, tablet or PC. It works via Bluetooth with iOS and Android devices, and through USB or Bluetooth for Windows, Mac and any other operating system that includes a screen reader with braille support. When using it as a stand-alone device, the Orbit Reader 20 is a braille reader, displaying the content of files stored on the SD card. The interface is easy, focused on allowing the user to scroll through the text and select other titles. For the younger users, getting to the next line of braille is made easy by pressing the panning buttons. For the more advanced users, the Orbit Reader 20 provides searching, bookmark and even note-taking capabilities. 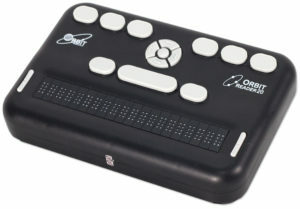 In addition to being a braille reader, the Orbit Reader 20 lets the user create and edit text. Make no mistake, the editor is simple. For more complex formatting or spell check needs, the user utilises a word processing program, such as Microsoft Word, on the PC with the Orbit Reader 20 functioning as the braille terminal. Sensory Solutions is proud to be an official distributor of the Orbit Reader 20 – contact us for more information, to arrange a demonstration and to place your order. Do you ship Orbit Reader 20 to Malaysia? I’m looking for 10 units to be imported to Malaysia. Thanks Quin Lee, your request was forwarded to our office for a reply.